Expat nightlife: beginning after work at 18:00 sharp! Looking for an in with the expat crowd in Brussels? 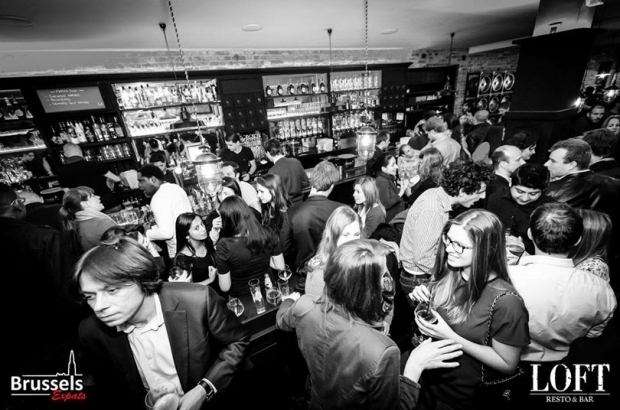 Then mark your calendars for Brussels Expats’ next Apéro Afterworks. Organised every other Wednesday (the last one was yesterday, Wednesday March 26th) from 18:00 onwards at LOFT Brussels (51 rue de Namur, Brussels), the young and fabulous come here to have a drink, unwind and leave a long day of work in the EU institutions behind them. This event, being just after work (hence the name), means that most attendees are dressed to the nines. But don’t let this intimidate you: the excellent mix of expats, locals & newcomers attending this event are open to seeking new friendships in the European capital. The age ranges from lower twenties to mid-thirties, as most people over this age probably have to dash off and pick up the kids instead of running to a happy hour (which is, by the way from 18:00-20:00). The venue (the LOFT Brussels) is nicely situated between Porte de Namur and Mont des arts, making it a nice change from the typical expat scene at Place du Luxembourg all while remaining easily accessible for most expats working in and around the centre of Brussels. The event requires no entry fee, and the drinks and food remain reasonably priced (€10-30). So round up some friends and colleagues, and make your way over to the next Apéro Afterwork on Wednesday April 9th. With some luck, it’ll already be warm enough for the bar to open up its summer terrace.